THE MORE TIME GOES BY, THE MORE WE SEE HOW PIVOTAL THE MAC BRIDE PRINCIPLES HAVE BEEN. These new files, from the Northern Ireland Department of Economic Development, were released under the 20/30 year rule . Amongst the files released under the 20/30 year rule is correspondence relating to the application of the MacBride fair employment principles to United States companies operating in Northern Ireland, including DuPont in Londonderry. 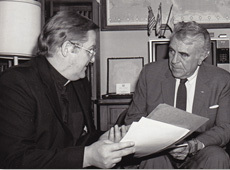 The principles – which were drawn up by the former IRA Chief of Staff and Amnesty International co-founder Seán MacBride in 1984 – were designed to protect minority employees and prevent discrimination. The new files released under the 20/30 year rule are from the Northern Ireland Department of Economic Development. One of the files is listed as: “File correspondence and reports concerning the application of the MacBride principles to American firms trading in Northern Ireland.